Scott has a valid point and his answer is completely acceptable. 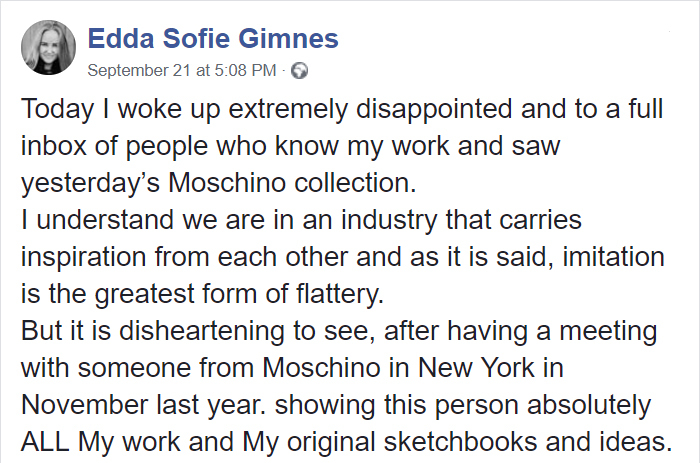 They've been doing it for years, so if anything, she was copying Moschino, not the other way around. But I think you can't copyright doodling, so no infringement here. I can similarities between her work and Moschino, but there is no way that that is a copy. As a designer (but not fashion) I have to say that the similarity between these works is almost non-existent. It doesn't require an "eye for detail" to notice differences. A vague similarity is not a copy. One has to wonder if the designer even comprehends the concept of "copy". The only way one could validly say these are the same is if you are blind as a bat. In the examples shown there isn't even a similarity in the cut of any clothing. Fwiw, some cosplayers have been doing the "scribble/sketchy look" thing for years. 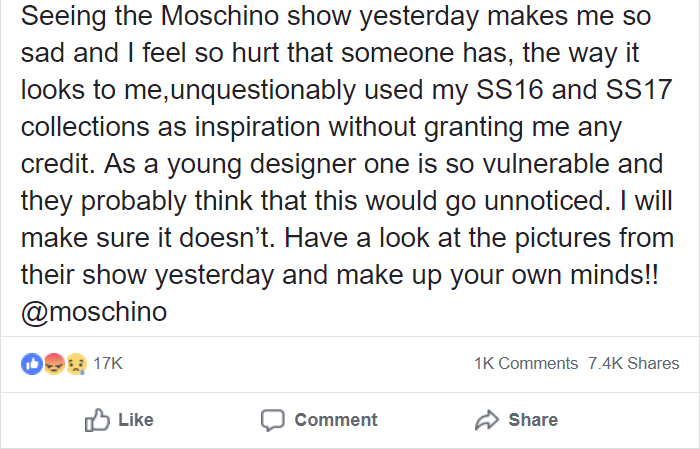 From the examples in the response Moschino made, they have been doing it probably longer than Gimnes has been alive. 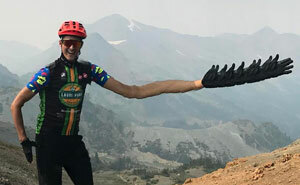 So... who copied who? I agree completely. They're not at all similar except for similar color schemes (which might have been proof of her claim if said color schemes were more unique, but here it's only black and white and some pink, it's super basic) and using the same style, which is nothing new and the company has shown proof that they've been using for a long time. 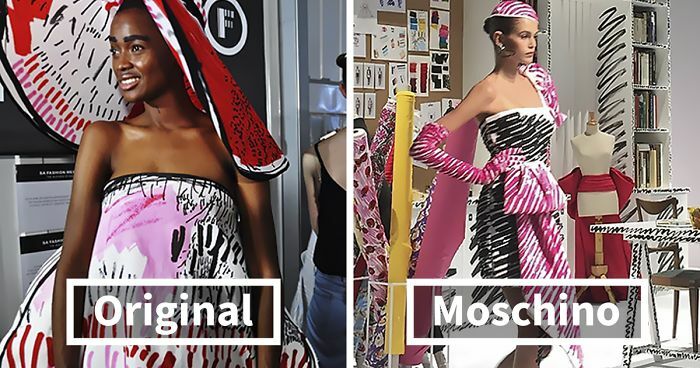 I also think it's quite hypocritical of her to think they need to credit her for "inspiration" when she claims her designs to be completely her originals when she did not invent the style - where is her credit to her sources of inspiration? Nothing is created from nothing, ever. And more often than not creators will take inspiration for a lot of places, and not a single source. Unless it looks nearly the same with minor differences, it's not a copy. 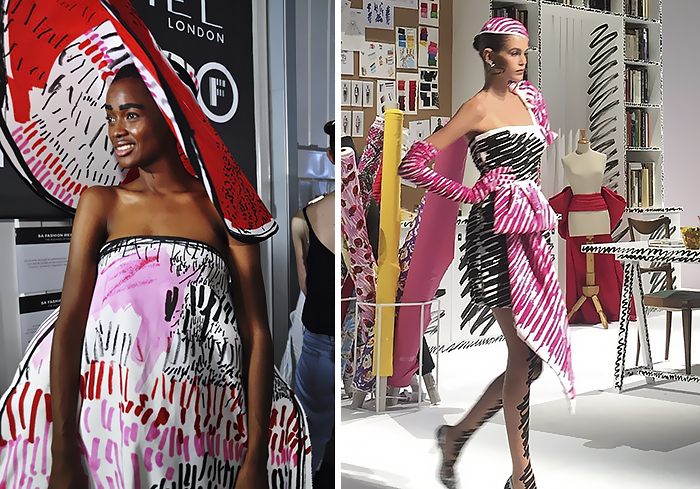 Her textile designs are VERY inspired by Moschino and other brands who used the scribble look hugely popular in the 80s. (I work in the fashion industry, if that matters.) She didn't invent scribbles. 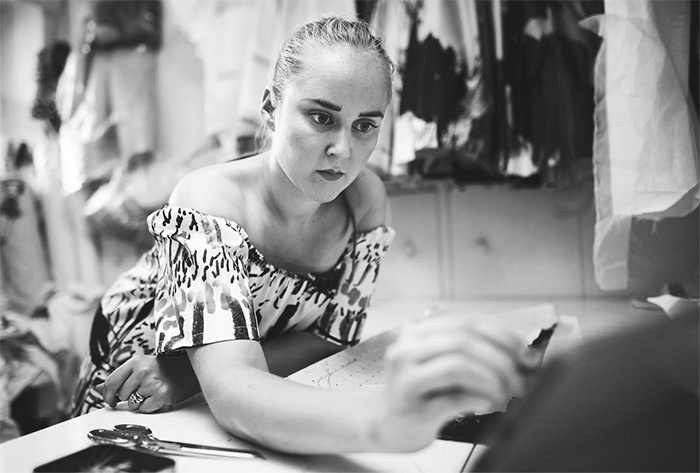 But she is talented and understands trends and colorways and proportion. Just let it go and get a job with a brand that appreciates your talent.